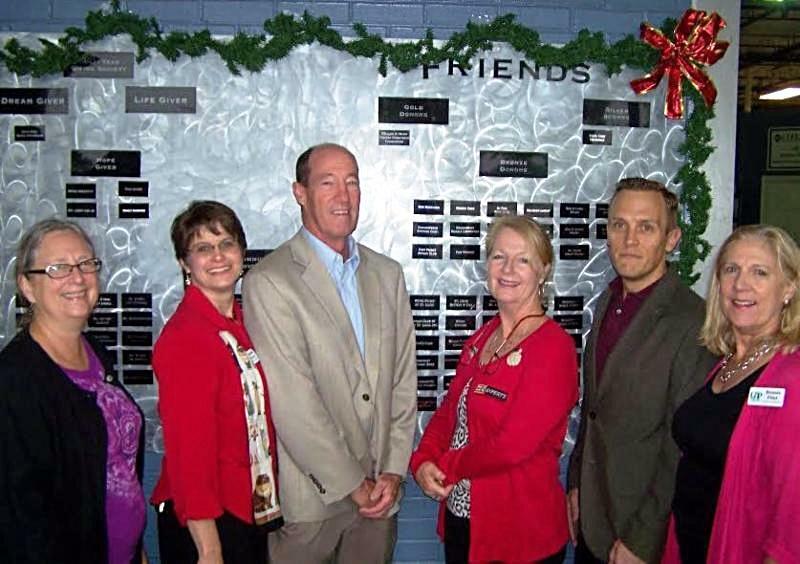 L-R: Dona Alexander, United Against Poverty, Stefanie Myers (Executive Director, UAP), Bob Calhoun, Rotary, Linda Sampson (President, Ft. Pierce Rotary), John Wellborn, Rotary, Bonnie Flint, (Director of Philanthropy, UAP). December 2016 Members of the Fort Pierce Rotary Club were recognized by United Against Poverty for their activism and support of UAP’s mission in St. Lucie County. Joining President Linda Sampson for their plaque installation on the group’s Wall of Friends were fellow Rotarians Bob Calhoun, John Wellborn, and Rick Haisley. The group toured the Member Share Grocery Program and learned more about the UP Center’s vision of becoming a collaborative beacon of hope for those in poverty looking to lift themselves out of poverty. “Rotary sees the need to assist those struggling to make ends meet and United Against Poverty’s approach just makes sense, “shared Linda Sampson. “This is a vibrant organization that assists more than 450 St. Lucie residents a day. They partner with those in poverty and importantly, restore hope and dignity in the process. It is not simply a one-time donation of food, but typically the beginning of a partnership to propel these individuals out of their desperate situations.” United Against Poverty is the former Harvest Food and Outreach Center and has been serving St. Lucie County since 2006. This year the organization rebranded to more accurately represent its wholistic approach to lifting lives out of poverty through crisis care management, a member share grocery program, and a host of services and referrals. Based at the UP Center at 2520 Orange Avenue, future plans include expanding programs to help stabilize the lives of those in poverty through case management, emotional intelligence training, job skills classes, internships and job placement. To learn more, volunteer, or make a donation, go to www.upslc.org, call Stefanie Myers, Executive Director, or Bonnie Flint, Director of Philanthropy at 772.468.8543.